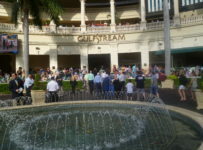 Racing is back on the turf at Gulfstream Park for Friday’s nine-race card, which has first post of 1:15 p.m. 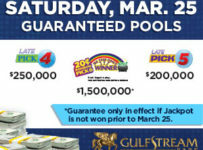 The carryover on the Rainbow 6 has grown to $356,270. 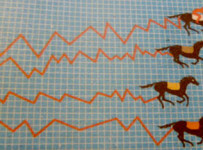 It is on races four through nine, with the sequence scheduled to begin at 2:53 p.m. 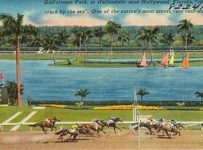 The dirt track is listed as fast and the turf is listed as good. 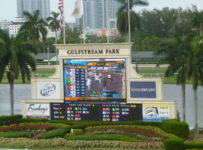 The second, fourth, fifth, seventh and eighth races are scheduled for turf. 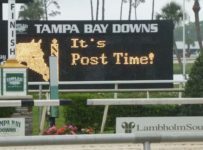 The Weather Channel forecast is for a chance of scattered thunderstorms throughout the afternoon—peaking at 55 percent around 3:00 p.m.
On Thursday, rain before and during racing hours forced Gulfstream to take four races off the turf. 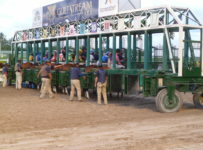 The Friday card has eight claiming races. The exception is the fourth race. 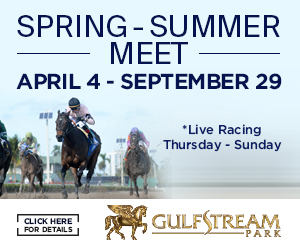 It is a $50,000 maiden special weight for 2-year-old fillies at five furlongs on turf. We will have coverage of that race and of the Rainbow 6 on our blog, which can be accessed on the menu bar at the top of this Web site’s home page. 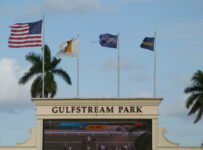 *Gulfstream, as usual, will have live racing on Saturday and Sunday this weekend. It also will have racing this Monday May 29, with a special Memorial Day card. First post is 1:15 p.m. each of the three days. 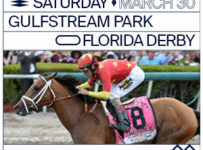 Gulfstream will have two stakes races on Saturday. 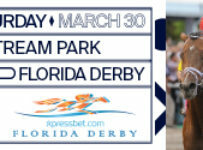 The race is part of a new ten-race series of stakes that are funded and sponsored by Gulfstream and the Florida Horsemen’s Benevolent and Protective Association. 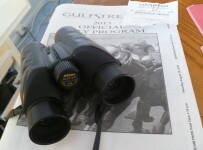 All ten races have $100,000 purses. 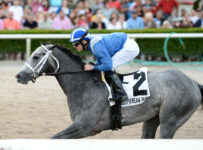 The Musical Romance is one of six races in the series that are restricted to Florida-breds. The other four races are Florid-preferred. 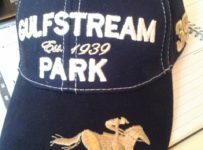 They are open to horses bred in any state, and bonuses will be paid to Florida-breds that finish third or better. 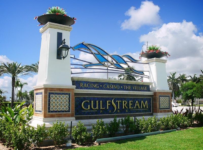 On Saturday, Gulfstream also will have the $75,000 Christmas Past Stakes, at 1 1/16 miles on turf for fillies and mares 3-years-old and up. It does not have a restricted or preferred status.